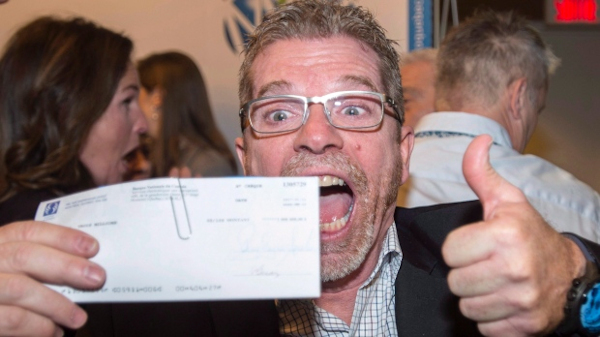 Lottery winners in Quebec are getting a new way to practice saying ‘No’ when asked for money. Loto-Quebec began offering virtual reality technology Wednesday to winners who might have trouble knowing what to do or say when faced with exuberant family members excited by their windfall, siblings offering unsolicited investment tips, or friends hinting that they’d like to join them on a big trip. Lotto spokesman Brian LeCompte says it involves wearing a headset that immerses the user in various scenarios they will likely face at a house party or in the workplace. First we called it ‘computers in education’. Then it was the World Wide Web. Then it was the reincarnation the Internet in the form Web 2.0 and social media. For a long time, we educators have lived with enthusiastic talk about the implications of technology in learning. Sometimes the talk has been plausible. At other times the results of using technology in learning have been disappointing. For all the hyperbole, education is in many sites and many ways still relatively unchanged—the relations of teachers to students, students to each other and students to knowledge—and this is the case even when technology is used. For instance, if the print textbook becomes an e-book, do the social relations of knowledge and learning actually change? If the pen-and-paper test is mechanized, does this change our assessment systems? Technology, in other words, can and often does reproduce and reinforce traditional, didactic relationships of learning. However, today’s information and communications technologies also offer affordances which in many ways we have barely yet explored. These possibilities we call a ‘new learning’, and ‘transformative pedagogy’. How then, can we create and use technologies that push the boundaries of the learning experience, engage students more deeply and produce learning outcomes that live up to the high expectations of citizens, governments and workplaces in the twenty-first century? For this reason, in this research network, we want to focus not just on e-learning, but the pedagogical innovations that we hope e-learning environments might support. In this agenda, the ideas and practices of ‘ubiquitous learning’ suggest a wide range of possibilities. Some people have no problem flipping and flying in virtual reality; others find this kind of activity literally sickening. 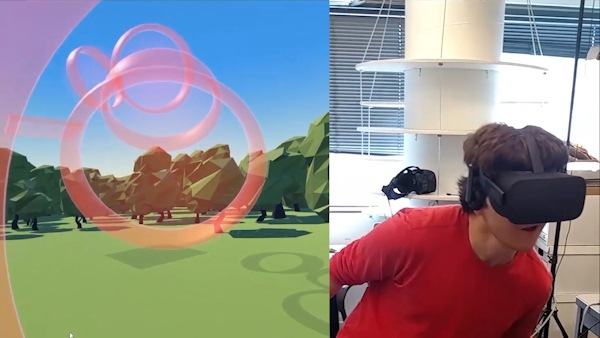 The problem stems from a disconnect between your eyes and your inner ear: what you see doesn’t always match up to what you’re feeling when you wander around a virtual environment with a headset on. It doesn’t bother everyone, but it remains one of VR’s biggest challenges to becoming a mainstream technology. 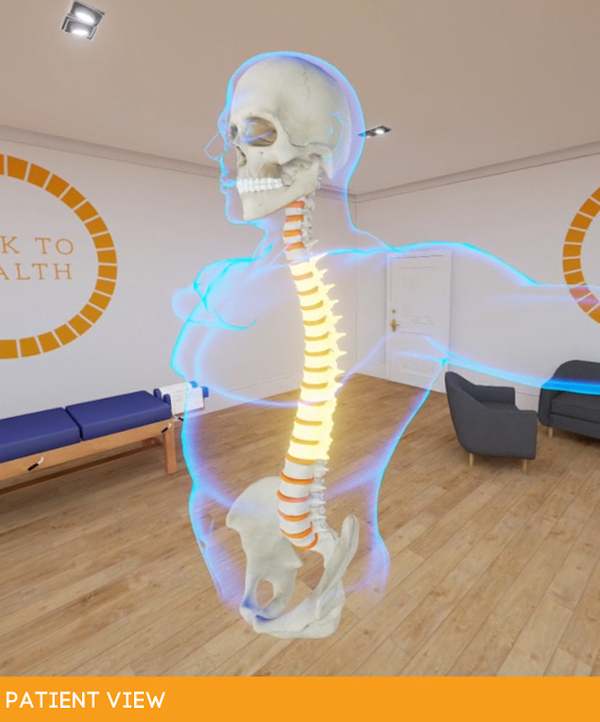 Can virtual reality and presence help to beat back pain? Looking at the skeleton suspended in front of me, I was shocked to see how crooked it was. The hips tilted over to the right side, the spine to the left and the shoulders hunched over like someone very elderly. It looked painful. And I knew it was, because this was my back — and it had been causing me problems for about 15 years. I was using virtual reality (VR) technology to see for the first time what could be triggering my back pain and stiffness. Although I was sceptical at first, something clicked as I examined the 3D image. It suddenly seemed glaringly obvious that my poor posture was putting painful stress on my back and joints. Seeing my problems ‘in the flesh’ — albeit virtually — finally helped me understand why I might be in pain. ‘Understanding is the first step towards getting better,’ says Matt Flanagan, a chiropractor at Back To Health, the West London clinic behind the technology. Digital cultural heritage is now a mature field, in which information technologies are used in the service of preserving cultural heritage. The digital form of resources allows for the exploitation of advances in data analytics, semantics, information retrieval, user interaction, profiling and personalization in order to develop new, exciting and stimulating cultural heritage experiences in tourism and education. This special issue of the User Modelling and User Adapted Interaction (UMUAI) journal aims to form a reference point for the field of personalized delivery of cultural heritage content. We invite works that present and/or review the current state of the art in theory and practice, as well as promising recent advances in the area of aligning the delivery process for cultural heritage content to the needs, goals, characteristics and preferences of individual users and groups of users. The issue is broad in scope, with the caveat that emphasis should be on the link between cultural heritage and personalization techniques; works dealing exclusively with one of the two topics will be deemed out of scope. Today’s cocktailer has seen (and sipped) it all, from drinks made of actual trash to cannabis infusions and libations chilled with striped ice cubes. Is the next step in this augmented drinking experience, well, augmented or virtual reality? For years, liquor brands have been using virtual reality as a high-tech marketing technique to better acquaint customers with their brands. Patrón tequila, for example, has a VR viewer that connects to an app: The app takes viewers on a virtual tour of the brand’s distillery. Beer brand Dos Equis has placed Oculus Rift headsets in bars to plunk customers into the virtual world of its mascot, The Most Interesting Man in the World. Now, virtual reality drinks are starting to pop up at restaurants across the world. 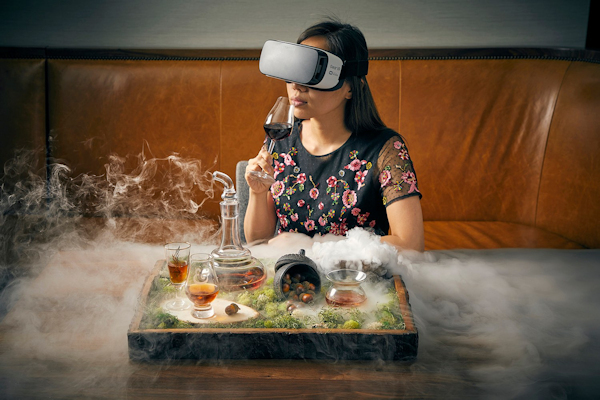 In London, for example, One Aldwych hotel serves a Dalmore whisky cocktail mixed with cherry puree, grapefruit juice, and VR goggles that transport drinkers to the Scottish Highlands. Stateside, Baptiste & Bottle restaurant at the Conrad Chicago Hotel rolled out the $95 “Macallan Rare Journey” in July. First thing’s first: While billed as a “virtual reality cocktail,” the drink itself is not virtual. It’s real liquor, enhanced with a short video that details the process by which the scotch brand gets its custom casks. Applications are open for a three-year full-time Doctoral studentship, fully funded by the Arts and Humanities Research Council (AHRC), to undertake practice-led research into creative forms that engage the senses beyond the audio-visual. Emerging digital creative technologies are enabling the development of immersive experiences and installations that engage with audiences through senses including touch, taste, smell, thermoception, proprioception. This studentship, based at UWE Bristol’s Digital Cultures Research Centre, offers a unique opportunity for a practice-based exploration of this emerging field, and for the development of a body of work that will be of significant interest among creative practitioners seeking to engage with these novel practices. Working closely with innovators in the field and through self-directed practice, you will explore approaches to the design and production of these immersive experiences. You will contextualise these practices historically and theoretically, and interrogate what they bring to storytelling. The studentship, a partnership with Watershed’s Pervasive Media Studio, offers the potential to develop case studies with residents including James Wheale (Understory) and Amy Rose & May Abdalla (Anagram). Joining an interdisciplinary Design Futures Lab cohort of 12 collaborative PhD students, you will be part of an innovative and cutting-edge group of researchers dedicated to reshaping industrial technologies and processes through embedded practice-based research.